Milk and cheese are popular dairy products that offer nutritional value and many health benefits. The milk used in these products can be derived from cows, sheep or goats. The final product varies depending on the milk type and production process and can range from creamy fresh milk to hard, spicy cheese. Milk goes through a pasteurizing process before it can be sold commercially. After the milk is pumped, it is filtered to remove debris and may be fortified with vitamins A and D. The milk is then pasteurized to remove harmful bacteria. Once the milk has been pasteurized, it goes through a homogenization process to emulsify the fat droplets so the cream will not separate and rise to the top. Cheese is produced from milk. Cultures are added to pasteurized milk to begin the cheese-making process. These cultures determine the texture and taste of the cheese. Enzymes are added to the mixture to help the milk form curds. At this point, the production varies according to the type of cheese being made. Soft cheeses are produced from curds, while harder cheeses are made by pressing and curing the curds. The nutrition in types of milk and cheese depends on the processing they go through. According to the Dairy Council of California, one cup of whole milk contains 156 calories, 8 g of protein, 13 g of carbohydrates, 12 g of sugar, 8 g of fat and 301 mg of calcium. Milk types such as 1 percent and skim have lower fat and caloric contents. The nutritional value of cheeses varies depending on their type and the production process. One 2 oz. 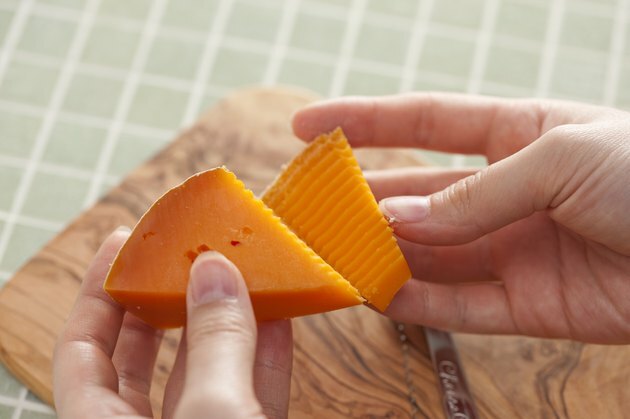 serving of cheddar cheese contains 114 calories, 7 g of protein, 0.4 g of carbohydrates, 9.4 g of fat and 204 mg of calcium. Milk and cheese are both excellent sources of calcium. This nutrient plays an important role in bone and tooth structure. Eating a diet high in calcium can help reduce your risk of developing osteoporosis. Calcium is also known to help lower your blood pressure levels and reduce your risk of hypertension, as well as helping to protect your heart muscles, according to OrganicFacts.net. Both milk and cheese are also high in protein. Protein helps establish, strengthen and repair your muscles, tissues and ligaments. Protein also strengthens your nails, skin and hair. Although milk and cheese offer many potential health benefits, there are some nutritional considerations regarding the consumption of these products. The total fat and saturated fat content in milk and cheese can be very high, depending on the processing the product went through. Choose low-fat or fat-free milk and cheese types if you are following a low-fat diet. Milk and cheese may also have negative health impacts if you are lactose intolerant. In this condition, your body cannot properly process the lactose, or milk sugar, in dairy products. If you are lactose intolerant, avoid products with lactose, and choose lactose-free milk varieties.